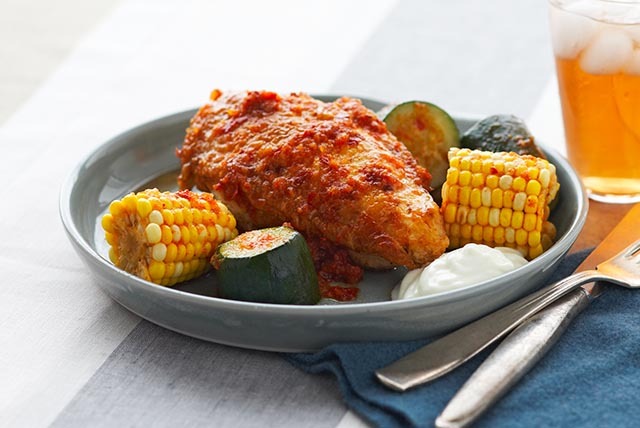 Got a broiler-fryer chicken and some corn on the cob and zucchini? Watch this video recipe to find out how to make an easy summertime skillet. Blend water, chiles and onions in blender until smooth; strain. Discard solids; set strained liquid aside. Heat dressing in 6-qt. Dutch oven or large deep skillet on medium heat. Add chicken; cook in batches 5 min. or until browned in all sides, turning occasionally. Add corn, zucchini and epazote leaves. Pour strained chile liquid over ingredients in Dutch oven. Bring to boil; cover. Simmer on medium-low 20 min. or until chicken is done (165ºF) and vegetables are tender. Stem and seed chiles. Soak chiles in 1 qt. (4 cups) hot water 10 min. or until chiles are softened. Drain chiles before using as directed. Squeeze with a fresh lime just before serving.